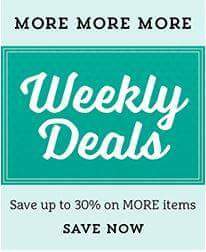 It's that time of the week again - Stampin' Up have released a new range of Weekly Deals! These deals run until Tuesday 15th December '15, or until all of the stock sells, so make sure you don't miss out! Click here for more information and the special Weekly Deals prices on the products below.